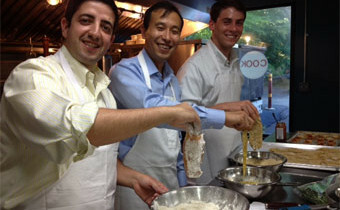 Our lively corporate cooking events build teamwork and inspire camaraderie and collaboration—perfect for companies looking to increase internal ROI, boost morale, gain productivity, and amplify employee satisfaction. 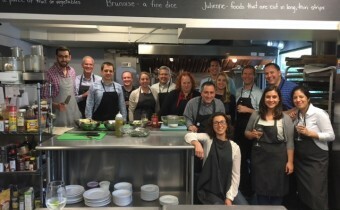 To succeed in the kitchen– navigating sizzling hot plates and sharp knives in tight spaces–teams not only have to get along, but also have to demonstrate masterful communication, true trust, and genuine support. Your group will arrive to a selection of tasty hors d’oevres and refreshing beverages to get into a convivial and culinary mood. 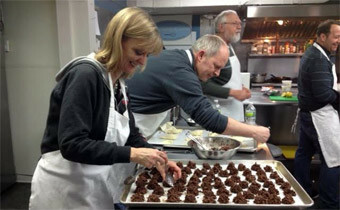 Guests then slip on aprons and divide into teams that work together to create delectable masterpieces. 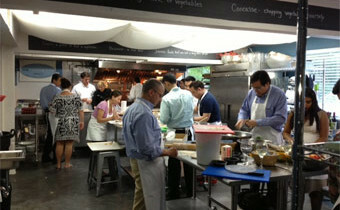 Once the cooking is finished, everyone is invited to sit down, relax, and enjoy fresh-out-of-the-oven creations. Alison, The event was amazing. Everyone, and I mean everyone had a blast and felt like the team bonding was exceptional and the food even better (the beef was like butter - amazing!) Thank you, thank you, thank you for your energy, your engagement and of course, the pictures. I'll figure out how to promote you in this complex and make sure to point any and all business that I can think of, your way. Thank you again for putting together such a lovely evening for us. 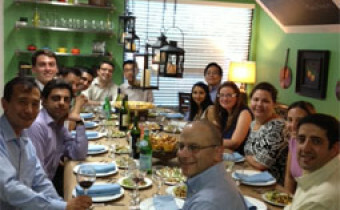 I ��m sure we posed as a difficult challenge with the changing schedules and headcount. Truly appreciated the patience and quick turnarounds with questions! 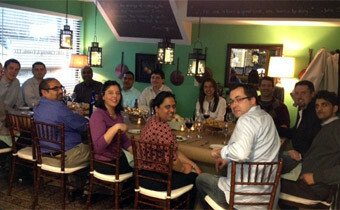 We are a newly-formed team with many personalities and work styles. 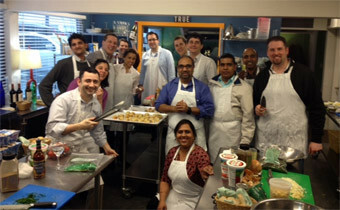 Your team building event really helped us put aside differences and work on a common goal. All the dishes exceeded everyone ��s expectations and made for a memorable activity (for both those who were beginners and expert chefs in the kitchen). Thanks for sending across the photos. I ��ve shared them with the team. I ��ll think of you and your wonderful team with any upcoming personal and professional events.